Dolomite (CaMg(CO)2) is certainly one of the most enigmatic sedimentary minerals on Earth. Its massive deposits of the past have very little contemporary analogues and today, scientists still do not have a consensus on how hundred meter-thick dolomite deposits of the Precambrian age (> 600 million year) were formed across the globe. Recently, the interest in dolomite has risen due to its importance as a major regulator not only of carbon cycle in the past, but also as an important host rock in ongoing projects of CO2 underground storage and sequestration. The growing demand for primary resources also impacted the interest in dolomite and dolomitic rocks, which are now widely used in numerous technological and industrial applications. For these reasons, there is a steady increase of scientific publications linked to dolomite problematics. A Web of Science search (all databases) with “dolomite” as the topic yielded more than 13,000 papers published from 1950-2015; 4,200 of them were published over the last five years and 8,800 were produced during preceding sixty years. The number of publications concerning use of dolomite in the field of engineering and physical science (non-earth sciences) increased five-fold from the mid-1990s to 2000s, and nowadays contributes to more than a half of all publications on dolomite. This clearly illustrates the rising interest in dolomite for technological applications over the past decade. This book incorporates a large number of disciplines, from geology to chemical engineering of catalysts. It illuminates three main aspects of dolomite as a major sedimentary rock and important technological material: (i) natural occurrence; (ii) laboratory study of dolomite dissolution and precipitation and (iii) applications in various technological aspects. 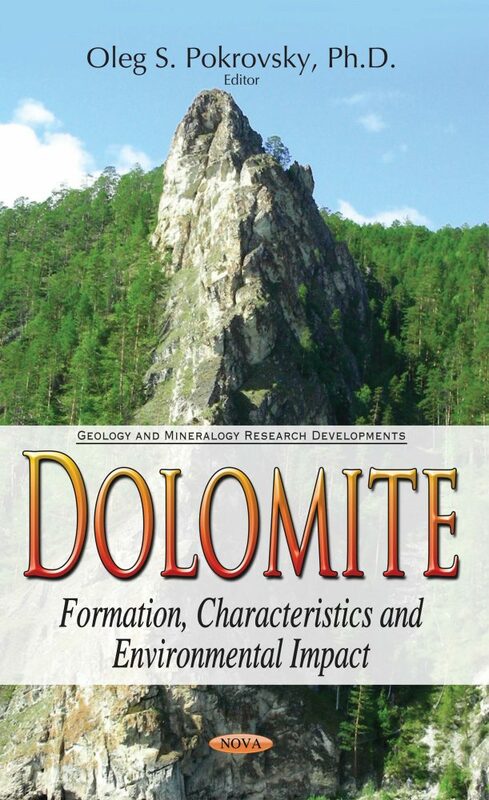 The first two chapters address geological and mineralogical aspects of dolomite deposits in the natural environment (Wagner et al. ; Marfil et al). The next three chapters cover the reactivity of dolomite in an aqueous solution (Pokrovsky and Schott), the synthesis of dolomite analogues from aqueous solution (Pina et al) and laboratory precipitation of Mg-bearing carbonates and protodolomite from homogeneous supersaturated solutions (Pokrovsky). Finally, the last two chapters (Ivanets et al., Ryabkov et al.) present the application of dolomite for numerous technological and engineering purposes. A multidisciplinary approach across wide geographical scales and various techniques presented in this book will be interesting for a large community of scholars, students, and researchers from academic and private organizations.